This is such a great item to have that you should buy one for yourself! Our heavy-duty, insulated canvas tote is the perfect companion to a night out at the Hollywood Bowl, the Starlight Bowl or any other venue you wish to attend. 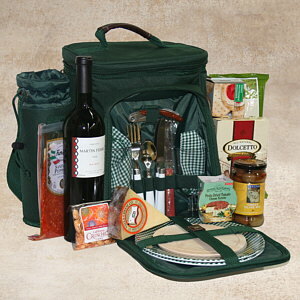 It comes complete with everything your outing requires: the wine, salami, cheeses, crackers, olives, cookies, plates, glasses, cutlery, cutting board and more. A gift that will be used and remembered for years to come. And, if you are going to a local bowl concert, just pop into Fancifull and have us refill it with great foods and wines from our store. So easy and, mmmmm..., so good.